Join the Be The Match Registry and Enter the Lottery to Save a Life. Just a quick drive announcement for any folks in New York City! 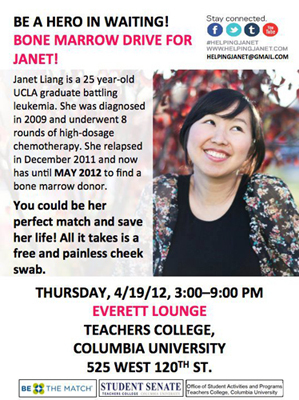 Janet Liang is still searching for a donor match in the bone marrow registry! Despite the fact that her initiative has helped to register over 13,000 people and resulted in marrow matches for several others, Janet herself still needs a donor. You could be the one to save her life. If you’re in New York City, please consider visiting Teachers College at Columbia University THIS THURSDAY to see if you’re a match! Remember that all the information you need with regards to the need, the process and frequently asked questions can be found throughout this site. Get informed, get convicted, and get registered! 35 new donors from Hope Astoria! 190 New Donors from GCC Philadelphia! Rest in Peace, Arthur Halim. Drive recaps! 22 new donors from NYU AACF and 7 new donors from Grace Faith Church! Copyright © Cheekswab 2012. All rights reserved.